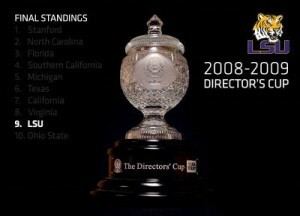 BATON ROUGE — Another record-setting and historical season in LSU athletics was capped on Monday when the school recorded its second straight top 10 finish in the Learfield Sports Director’s Cup with a No. 9 showing among all Division I institutions. The annual Learfield Sports Director’s Cup, which measures the overall strength of institution’s athletic programs, released its final standings for the 2008-09 athletic year following the conclusion of the College World Series. Points are awarded based on each institution’s finish in up to 20 sports – 10 women’s and 10 men’s.